Total weight gain: I haven't weighed myself this week. Maternity clothes? 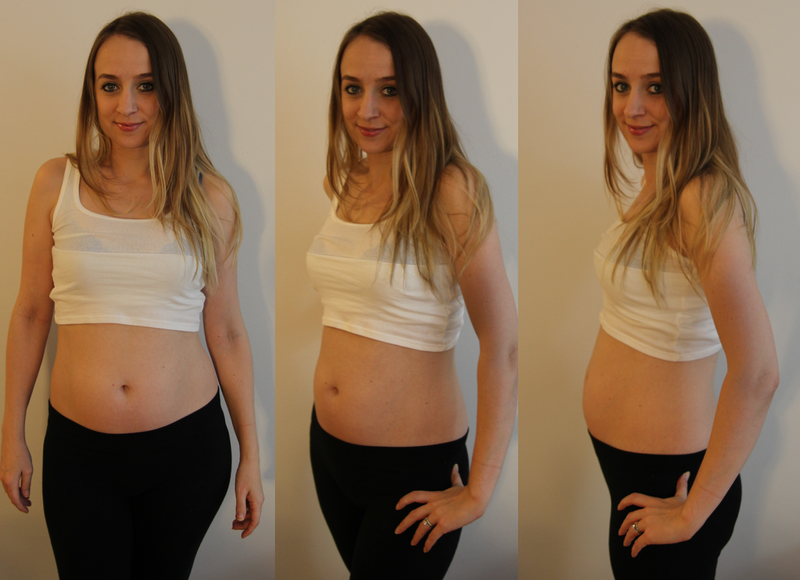 I really feel like my belly 'popped' at the end of week 16 and I am officially in maternity pants. After a packing meltdown last weekend, I ordered a few maternity items which arrived this week. Yesterday I packed up anything that didn't fit into boxes so my closet won't have that looming sense of depression about nothing fitting. Sleep: What sleep I got was amazing. I attended my company's user conference, which was amazing, but involved very long days. Friday and Saturday both included compensating naps. Best moment this week: Having our early anatomy scan, seeing Bricklet, and being assured all is healthy so far. And seeing Condoleezza Rice speak at our conference - she is inspirational no matter your political beliefs. Miss anything? My typical work clothes and wine in a really bad way one day. Movement: Pretty sure I am feeling some squirms now. Food cravings: Nothing really this week, but did get seriously jealous whenever I saw glorious dessert tables filled with goodies I could not eat. Anything making you queasy or sick: Cigarette smoke still, and luckily while eating out is still making me feel ill I managed to do so while travelling. Gender: We found out during our scan but are keeping it a secret until I can announce to my family in person in a few weeks. Symptoms: Low energy and a bit of hormonal acne on my forehead. I've never had problematic skin, so the latter is really freaking me out. I've just placed an order on sephora.com for some natural products to hopefully clear it up! Happy or moody most of the time: Happy, but definitely have shorter than usual patience. I also had the first random / person I haven't told I was pregnant congratulate me. I was a bit shocked as I know my stomach has looked similarly post-gluten so I didn't think it was that obvious. It was comforting though as it does indicate that I look pregnant and not chubby (I have not been coping well with my expanding girth and am very paranoid people will just think I have let myself go). Also, I put together a progression of 5-15 weeks (below) for your viewing pleasure - I sure have grown since the beginning haha!